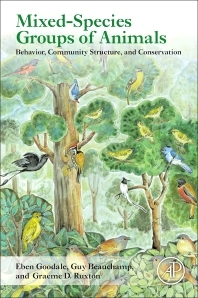 Mixed-Species Groups of Animals: Behavior, Community Structure, and Conservation presents a comprehensive discussion on the mixed-species groups of animals, a spectacular and accessible example of the complexity of species interactions. They are found in a wide range of animals, including invertebrates, fish, mammals and birds, and in different habitats, both terrestrial and aquatic, throughout the world. While there are more than 500 articles on this subject scattered in separate categories of journals, there has yet to be a general, cross-taxa book-length introduction to this subject that summarizes the behavior and community structure of these groups. The authors first survey the diversity of spatial associations among animals and then concentrate on moving groups. They review the major classes of theories that have been developed to explain their presence, particularly in how groups increase foraging efficiency and decrease predation. Finally, they explore the intricacies of species interactions, such as communication, that explain species roles in groups and discuss what implications these social systems have for conservation. 9.1. What Have We Learned? Eben Goodale teaches at Guangxi University in China and is a field ornithologist who has studied mixed-species bird flocks in South and East Asia and Melanesia. Originally an animal behaviourist, his studies on interactions between species in flocks have led him into issues of community ecology and conservation biology, and he has published more than 20 peer-reviewed articles specifically on mixed groups. Graeme Ruxton has worked on animal behaviour for approximately 30 years, and authored more than 300 papers on the subject; group living has been a particular focus throughout that time, and he is joint author of the 2002 monograph “Living in Groups,” which is still widely cited.